Plastic buttons was the cause of Broome’s pearling demise, at it’s peak, the once booming pearling port had over 400 pearl luggers in Roebuck Bay. 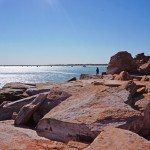 Almost overnight, pearl buttons were no longer needed and to this day, Broome remains a sleepy country town with it’s importance long forgotten. 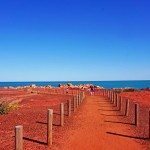 However, come sunset scores of visitors gather atop the grassy bluff overlooking pristine Cable Beach to watch the sun turn the sky a vibrant orange before slipping behind the Indian Ocean an absolute must when in Broome with kids. The pristine turquoise waters that lap the power white sand of Cable Beach is by far the biggest drawcard for backpackers and makes for a perfect family holiday. 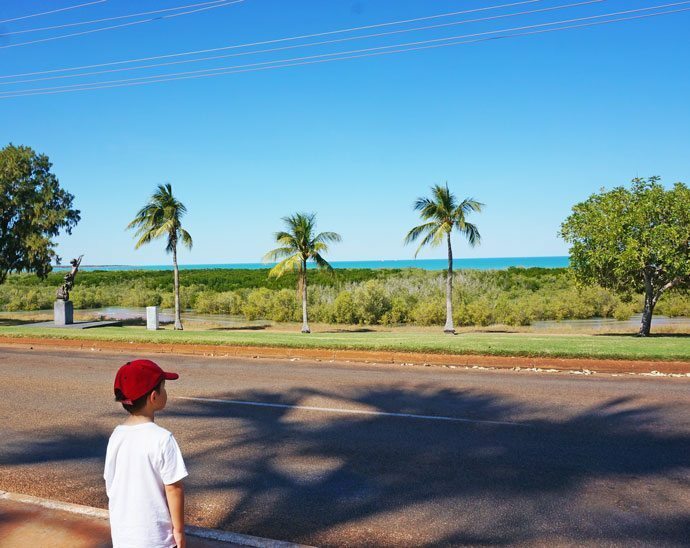 Beyond the beach and luxurious resorts there is plenty of things to do in Broome with kids including breathtaking landscapes, wonderful day trips and a rich and tragic history. 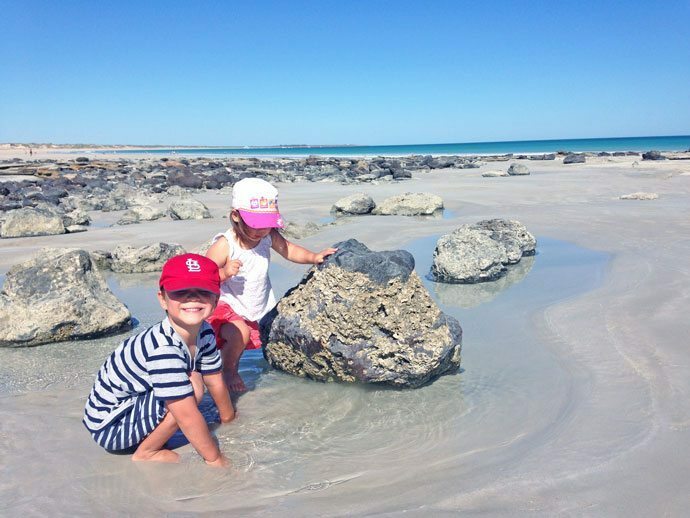 Broome is an exceptional place to visit with children and with direct flights from the East Coast it’s easy for families to get to. 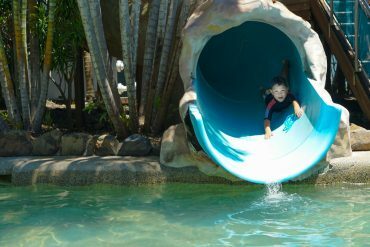 Better still, extend the family getaway to nearby attractions like the Northern Territory via Darwin for a trip like no other. Read about our Kakadu Yellow Water River Cruise here. Camel Ride on Cable Beach with kids - to ride or not to ride? Sand dunes and grass bluffs hug Cable Beaches’ 22.5km stretch of soft white sand and turquoise waters, creating natural viewing platforms of the vast blue of the Indian Ocean. We arrived at high tide when the sea had come right up to the sand bluffs leaving a long narrow stretch of coarse sand mixed in with the red dirt. 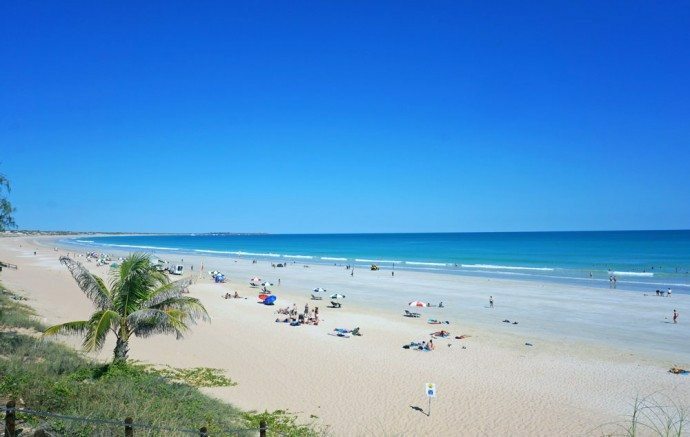 Even when Cable Beach was not looking its finest and despite it being closed due to a crocodile sighting, the beauty of Cable Beach was obvious and reason why it draws large groups of admirers to it’s shores. At it’s ‘ugliest’ it’s still worthy of Tripadvisors best beaches of the world accolade. When the tide is out and the lovely wide stretch of white sandy beach is fully exposed and without a crocodile in sight. Cable Beach is simply magnificent. Don’t mind the crowds either, there’s plenty of beach to share and it’s simply a matter of travelling along the beach, either by 4WD or by foot, until a private oasis is found. 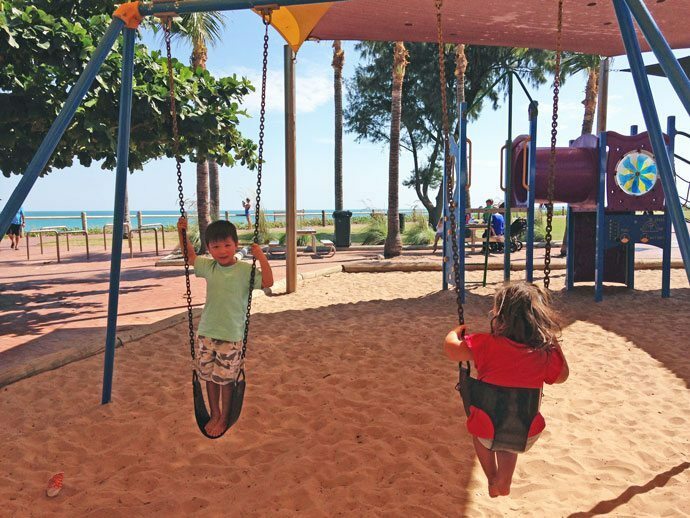 Kids are well catered for at Cable Beach, with a large patrolled section within easy access from the car park. 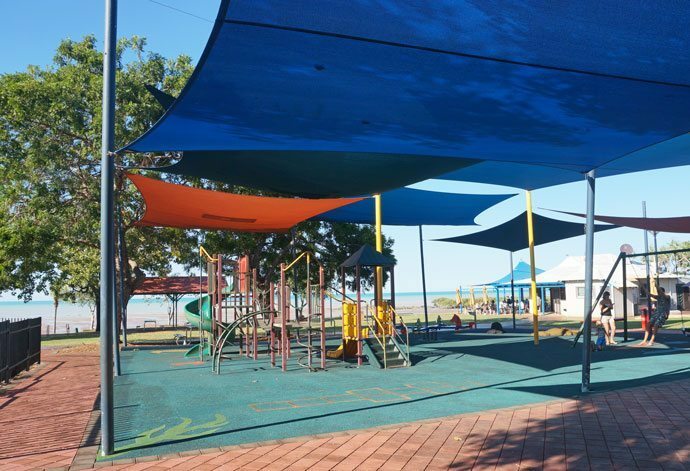 The Broome Surf Life Saving Club also hire umbrellas and beach lounges for a comfortable day, as the kids enjoy the gentle rolling waves. Toilets, showers and change facilities are located by the car park and main entrance. If the kids ever tire of the beach, there’s also a small shaded sandy playground. Not far from the car park is a ramp for 4WD access to the beach. There are lots of cars all having the same idea of driving to a secluded spot for a picnic and play. You will more than likely share a section of Cable Beach with other 4WD’s. However, a local advised that if you keep driving further along along you are able to claim a piece of Cable Beach to yourself. 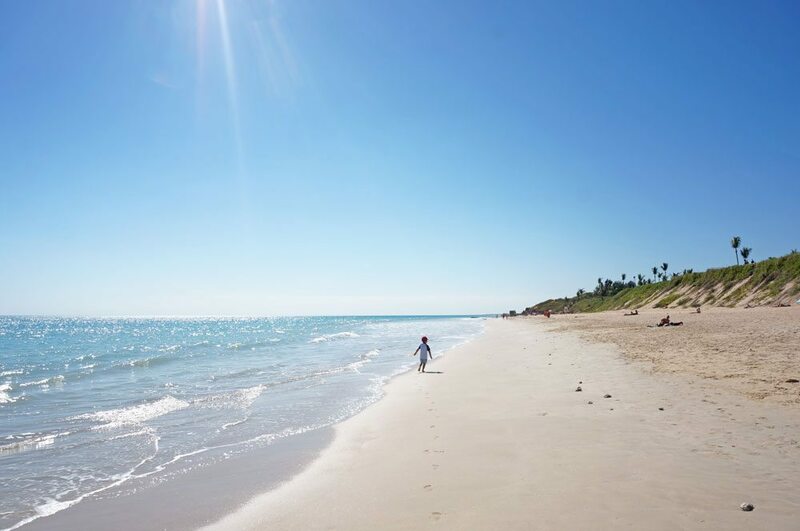 Go to Cable Beach with kids at low tide, where up to 900 meters of the white sandy beach is exposed and the water is calmer for kids to swim in. Strong currents (rips) are more apparent during high tide. Avoid the middle of the day when the sun is at it’s hottest. Go to Cable Beach in the morning or early afternoon to avoid the heat. Swim between the flags where it is patrolled for little ones as the beach has strong currents. Not to be missed is Cable Beach sunset. Spirits are high taking a stroll or even a Cable Beach camel ride as the sun sets over the water. 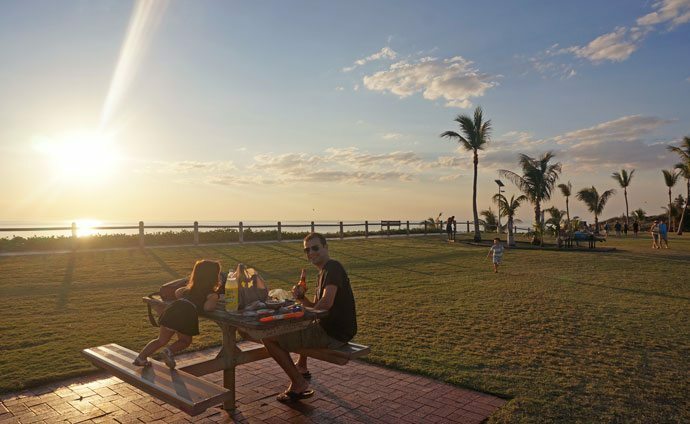 Other beach worshipers are having a few sundowners at either Zanders or Sunset Bar at Cable Beach Resort or enjoying the sensational view from the elevated grassed bluffs. It’s quite magical and worth a trip just for this experience. Check the local tourist guide for sunset times and arrive just a little earlier to secure a vantage point if you are visiting around public holidays, weekends or school holiday times. Pack a picnic and some favourite snacks for the kids to enjoy during sunset. There are a few picnic tables on the grassy area by the carpark, otherwise there’s plenty of soft sand on along the beach. There are also plenty of 4WDs further down the beach which have staked a great sunset spot. Bring something to entertain the kids whilst the sun goes down. Luckily there is allot of open space for the kids to play and plenty of other kids to keep them company. I brought a couple of bubble wands which worked a treat. Other families had soccer balls which kids were happy to kick around. Ready for Cable Beach sunset! Our picnic, kids bubbles and sneaky beers! 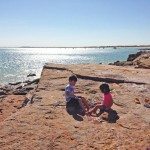 Camel Ride on Cable Beach with kids – to ride or not to ride? Should you avoid the cliche’ sunset camel ride on Cable Beach? Some say it’s a tourist trap and it is far better to enjoy the Cable Beach sunset and take a photo of the procession of camels as they walk past. I say go for it! Firstly, the kids love it. 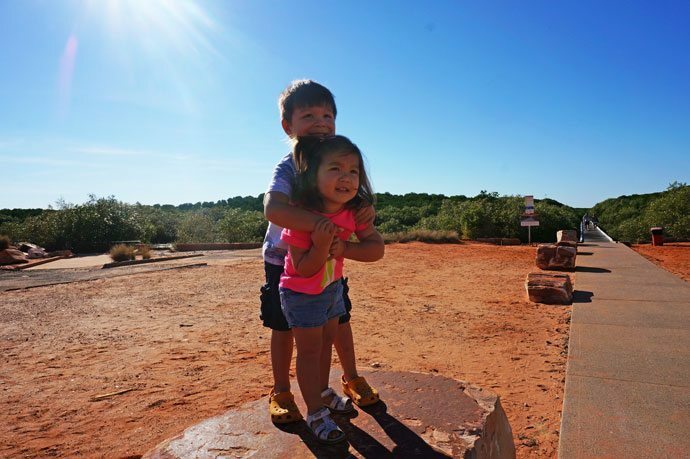 Secondly, it’s a unique and iconic experience of Broome with kids, and a most unforgettable family experience. Just as the Gondola rides of Venice or the Hot Air Balloon ride of Cappadocia are absolutely a touristy thing, it doesn’t make them any less fun. 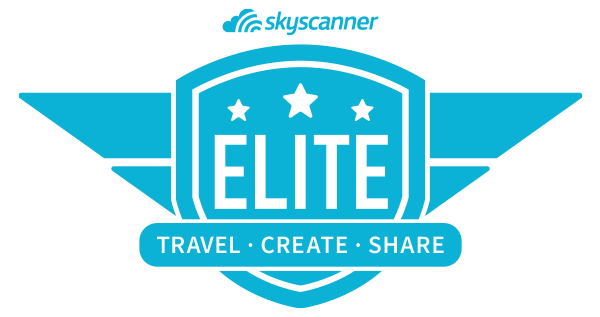 Read the full review of Broome Camel Rides with kids. 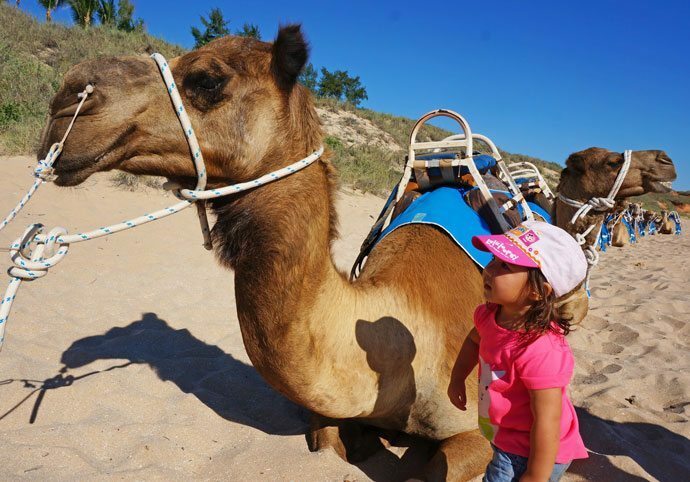 Broome with kids: Take a camel ride along Cable Beach, kids love it. 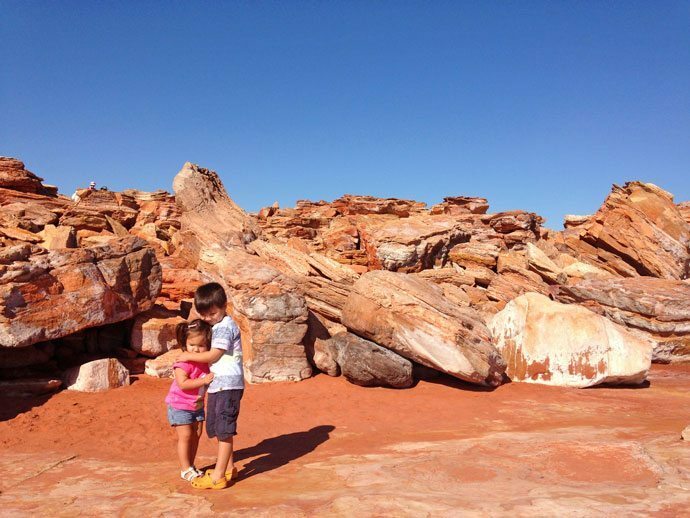 Though the promise of dinosaur footprints were the drawcard for the little ones, Gantheaume Point is perched high atop vivid red cliffs set against this striking blue of the ocean, with Cable Beach in the background. It’s a pretty scene indeed, even with an odd looking rusty metal lighthouse as it’s beacon. At low tide (where the tide is 1.7 meters or less), resting in the intertidal area are 130 million year old dinosaur footprints. 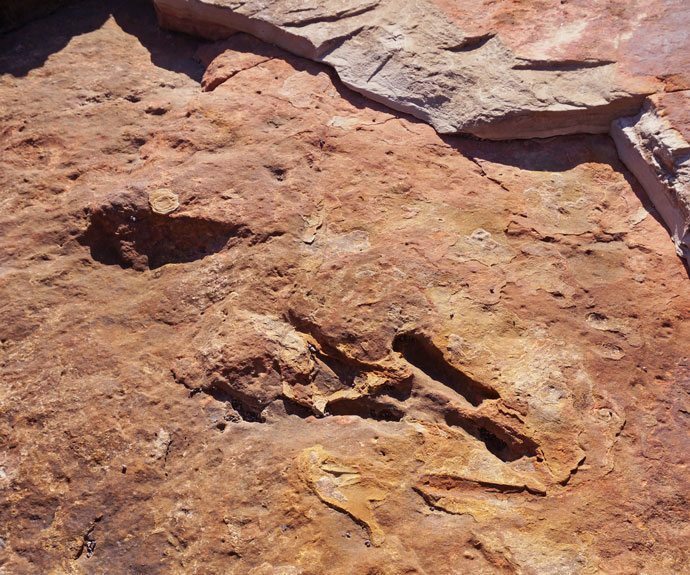 Apparently 20 species of dinosaur have been identified in the Broome area. It was hard to decipher what was and wasn’t dino tracks with no signage to point them out, though the kids had fun in the rock pools and scrambling along the cliff face regardless. The terrain is very rugged, with wet pools of water making the tidal area slippery. There is nothing fencing the cliff edge from the sheer drop below, it’s best to keep the little ones in arms or very close by. Whilst my 4 year old was able to navigate the rocks, my 2 year old was carried down, a baby carrier would be beneficial here. Could this be a dino print? How about this one? 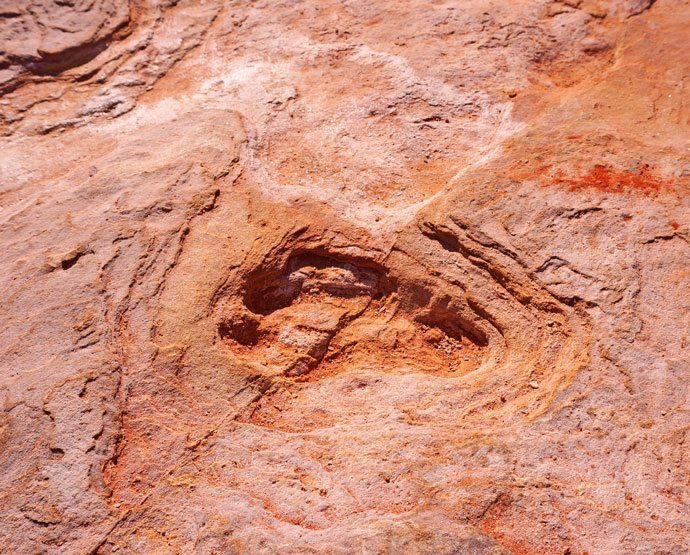 130 million year old dino print? 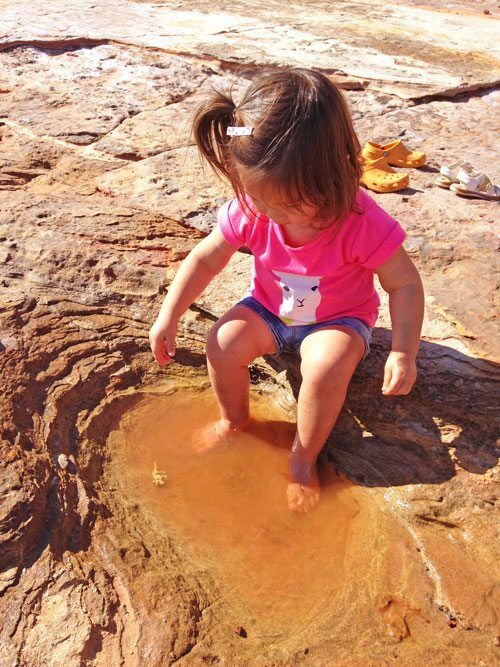 On the Broome Visitors Guide there is a small map of the dino tracks, which we conveniently left in the car. Don’t be disheartened by a failed sightings as the tide may not be low enough. There is a cast model replica at the top of the cliffs of a dino foot print in case you are among the masses that miss them. 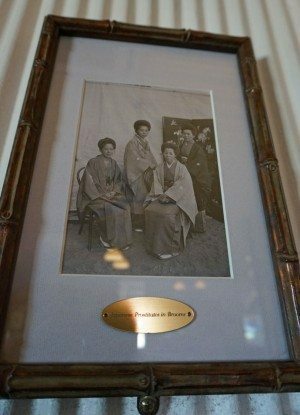 At the heart and soul of Broome lies it’s pearling history. 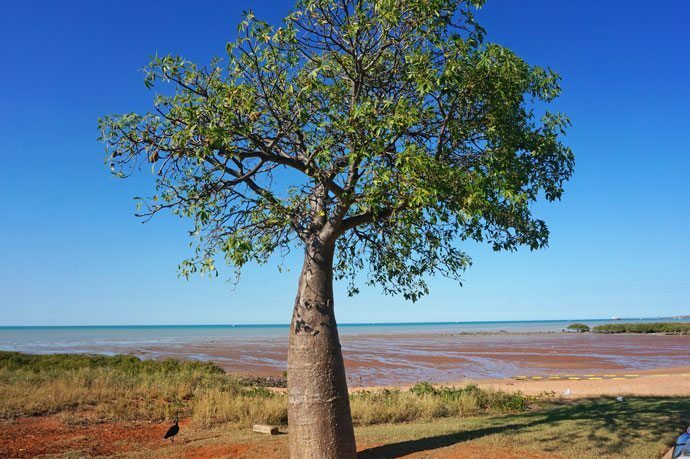 Roebuck Bay in Broome became the world’s premier pearling port for it’s highly sought after Pinctada Maxima. This large oyster was harvested for it’s lovely “mother of pearl” shell. It was in global demand for making such things as buttons. At the height of the pearling boom there were 400 Pearl Luggers (a boat used for pearling) and over 3500 people diving for pearl. The pearling industry attracted a diverse mulicultural mix of workers to Broome. Indentured Japanese as well as Chinese, Filipinos, Malays, Indonesians and local Aborigines worked under treacherous conditions to obtain these shells. Many meeting a tragic end from the bends, failed hard-hat diving devices, cyclones, shark attacks and drowning. In the Japanese Cemetery you will find 919 graves, most are pearl divers. The total number of deaths are unknown as many were lost at sea. The pearling industry came to a quick demise with the onset of World War II and later the introduction of plastic buttons. There are still glimpses of the pearling history. Streeters Jetty is a semi-restored jetty which was used during the pearling era, tracks used to be on the jetty which pushed carts of pearl shells from the luggers to the street. Today, the jetty takes you a very short distance over the mangroves to the torquoise blue waters of the bay at high tide, or more mangroves at low tide before abruptly stopping. 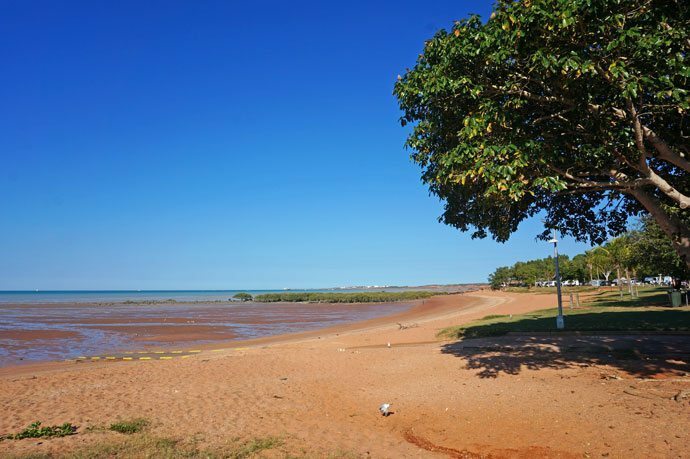 Town Beach is a calm safe beach to swim on Roebuck Bay. There is also a nice little playground and water park by the red sandy beach. The Town Beach Markets are held on the grassy area by the beach during Staircase of the Moon days. Roebuck Bay has some very impressive tides which can expose the bay to a wide stretch of red beach, mangrove and mud flats. It’s not breathtaking by any means, however two days a month it take pride of place for the Staircase of the Moon. Town Beach not exactly Cable Beach is it? 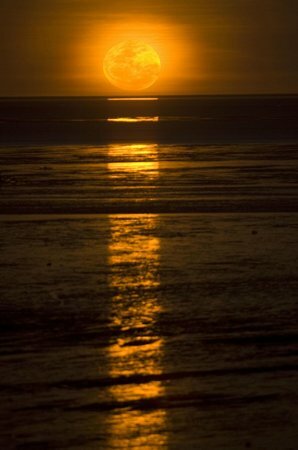 The Staircase to the Moon is a phenomenon where the moon rises over the mud flats creating an illusion of an illuminated staircase reaching for the moon. This extraordinary occurrence can be seen by the lucky phew from March to October on two select days of each month. The tide needs to be really low and the conditions just right. At 11am every week day Cygnet Bay Pearls has a free pearl demonstration to showcase their South Sea Pearls, which they farm in Cygnet Bay on the Dampier Peninsula approximately 200km from Broome. Here you can discover how they harvest an oyster and see the largest South Sea Pearl. For history buffs, it’s worthwhile taking the hour long tour run by Pearl Luggers Broome. They have an extensive collection of artifacts onboard two restored Pearl Luggers. 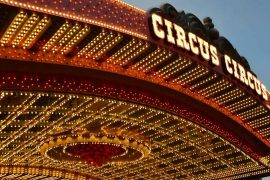 Children aged 5 and under are free and adults are $25 each. As it wasn’t an actual cruise on Roebuck Bay, we decided against taking this tour. Taking our two year would very much resemble a bull in a china store. There is a pearl lugger you can cruise on, the restored Intombi offers sunset cruises picking up at 1:30pm and returning after sunset with rave reviews. However it’s not cheap. A cruise would’ve set our family back $548. Adults are $159 and children 14 and under are $115 each. A bit of a treat when in Broome with kids. Around Roebuck Bay you will find souvenir shops, tourist vendors and the Roey the iconic Roebuck Bay Hotel established in 1904. Read about it’s history here. 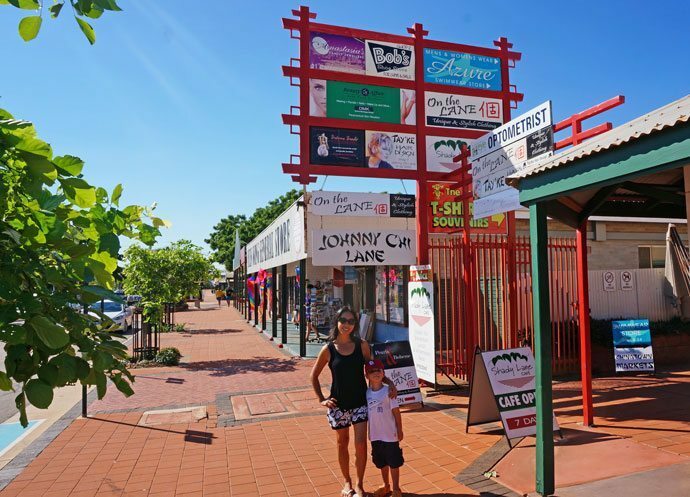 Broome’s Chinatown was a bustling Mecca for the pearling industry, where the Japanese did the diving, the Chinese were the pearlers, shopkeepers and cooks. 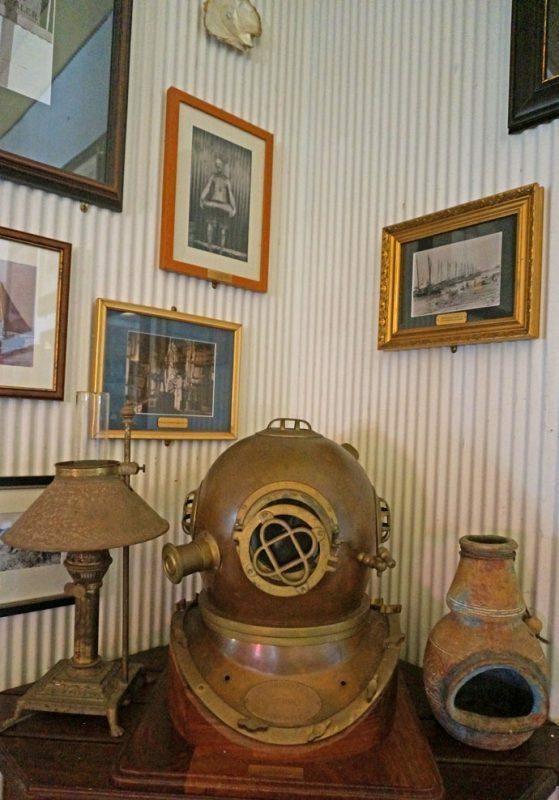 When pearl divers came in from 6 months at sea, they spent their earnings here. There were tailors, grocers, restaurant, shops. Also, the seedy side of Chinatown with brothels, opium dens and gambling parlors. 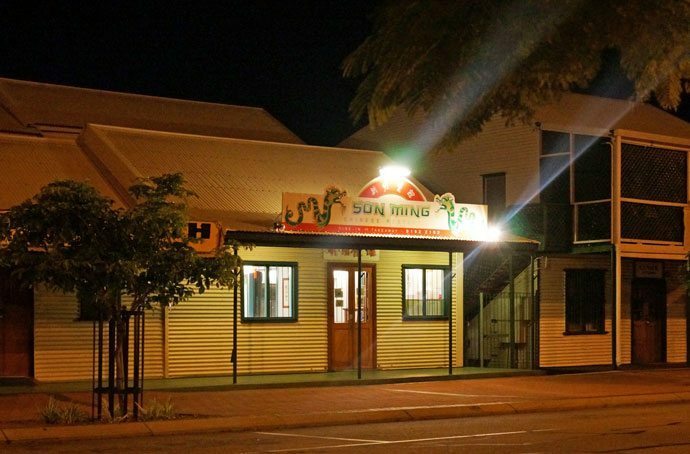 Although Broome’s Chinatown retains it’s name, it is not a traditional Chinatown as you would know it. There are only four Chinese restaurants remaining. Today Chinatown is the tourist hub of Broome. 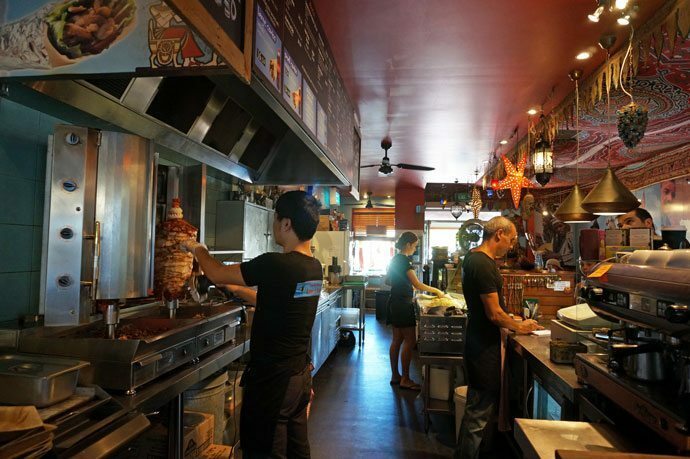 Along with the pearl and jewellery stores, there is a selection of restaurants, eateries, cafe’s, art galleries and also a large Coles Supermarket. 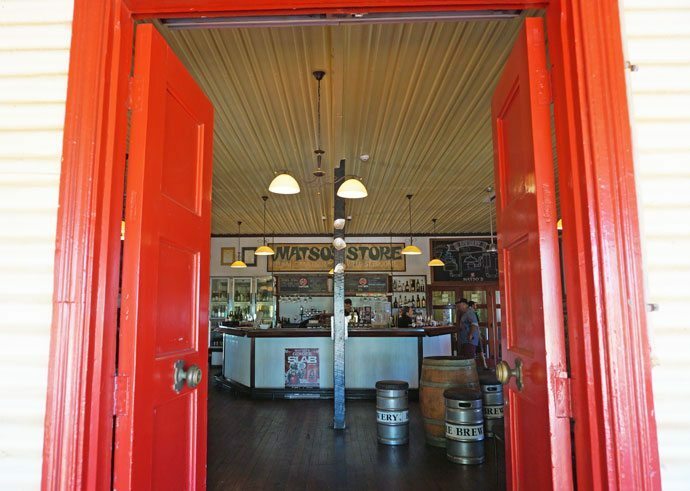 Broomes microbrewery, Matso’s is housed in a historic 100 year old brewery. Who needs a museum with some some amazing history displayed on it’s walls? 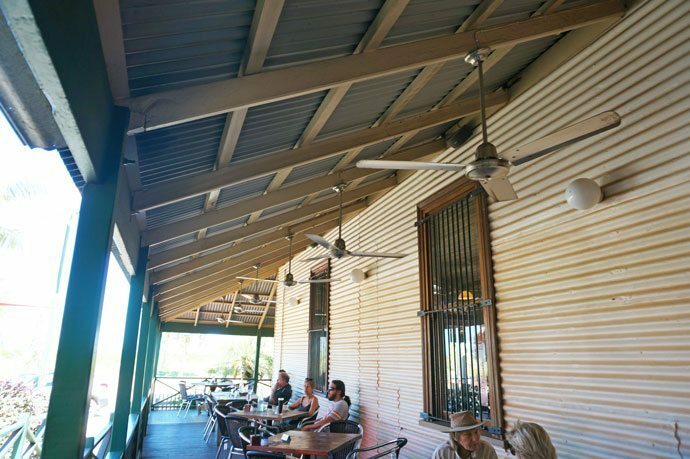 Wrap around breezy verandahs with views to Roebuck Bay, a great beer garden, casual pub menu and refreshing home brews, makes for a perfect spot to relax during the heat of the day. 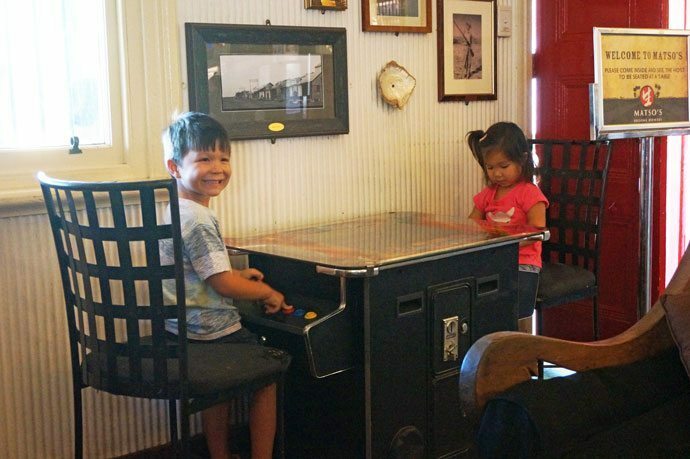 Matso’s is very kid friendly with a bit of space to run and a free retro arcade game to play. Kids are entertained as you sample some Mango Beer (quite delicious). Broome is hostile during the wet season (October – March). It’s humid, extremely hot with temperatures in the 40 degree Celsius with torrential downpours. Not to mention, mossies, midgies and stingers in the water. 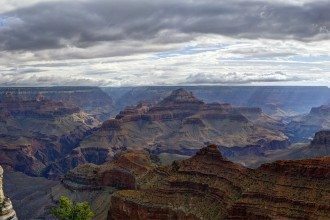 Roads and attractions can be closed, and store opening hours are shorter. Chess pieces for adults to play. Goto Broome with kids in the dry season from April to September, with blue skies, sunshiney days and the temperatures though still warm isn’t sticky and humid. The beaches are also safe to swim with the nasty stingers out of the water. We went in June and Cable Beach was safe to swim, the water was warm and the days were clear. Perfect for a stroll on the beach. 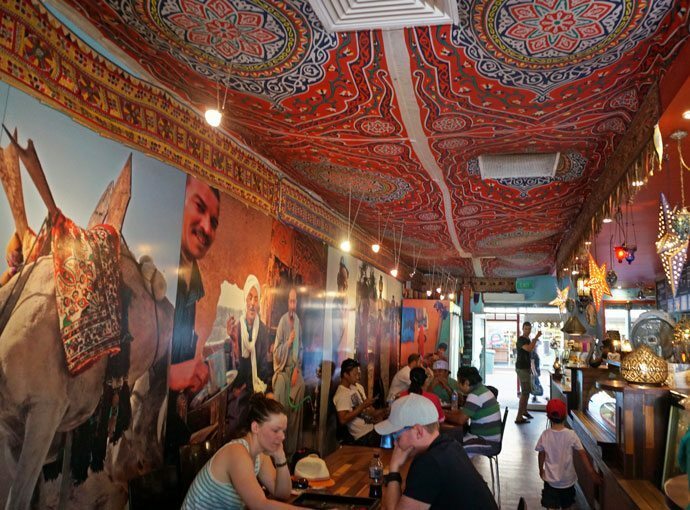 We stumbled upon Land of Pharoahs, a tastefully decorated Egyptian kebab shop. 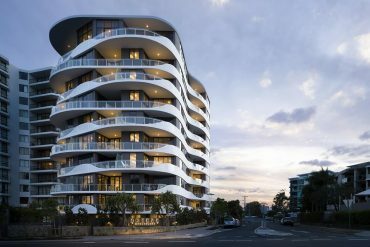 It’s located in Chinatown, right by the Coles Supermarket in Paspaley Plaza. The Tripadvisor recommended sticker on the door is always a safe bet. It’s bustling with people but most are getting takeaways and there is a quick turnaround on seating. 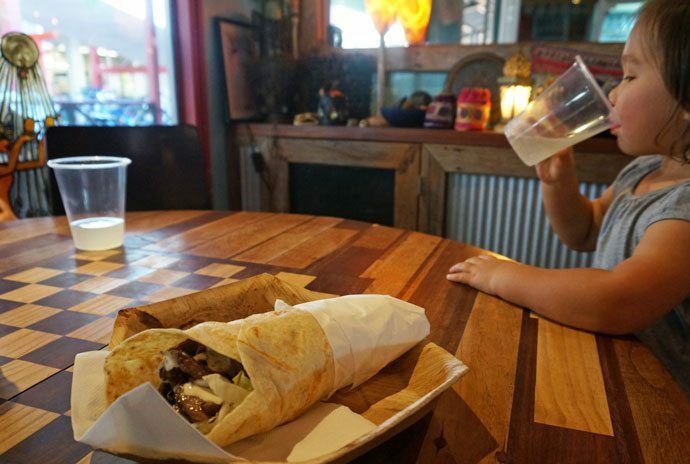 The service is friendly and efficient with our food arriving quickly which is always a bonus when eating out with kids. The kebabs are really good and well priced especially for Broome, at $13 for a large kebab. 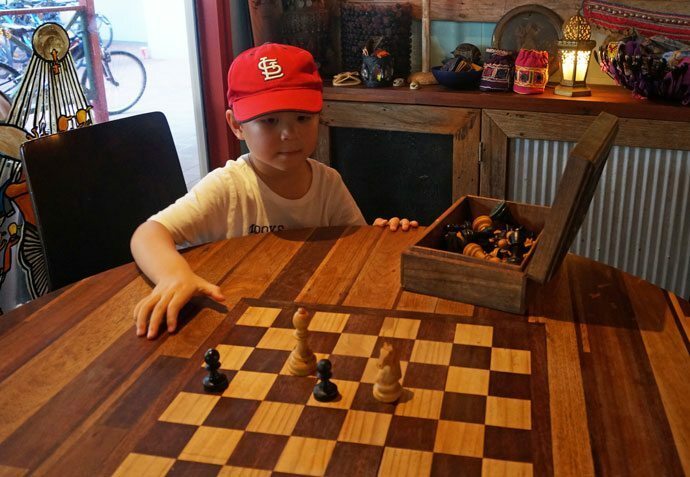 Romani came up to us and packed away some chess pieces that the kids were playing with, he explained that they had sentimental reasons for him and were rightfully not toys for our kids to play with. What was first class was his apology even though it was our kids causing the mischief. Another stand out with regards to service was the hot chips we ordered. They were fresh from the deep fryer, so as not to think they had forgotten about it, they explained they were letting it cool off before serving the kiddos, which was kind and considerate of them. 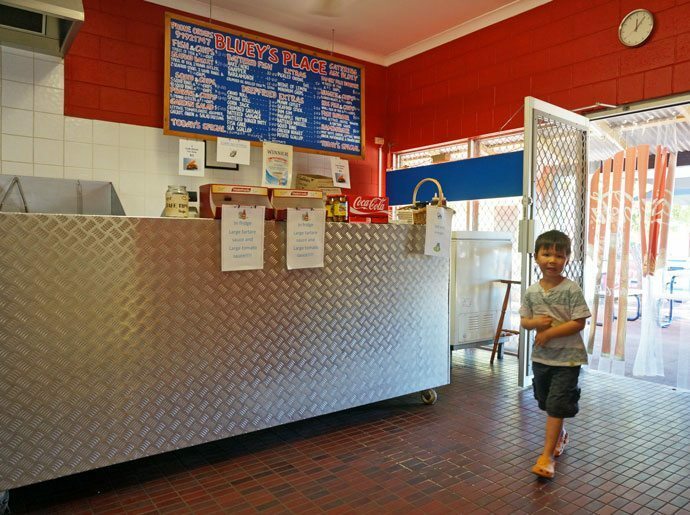 Bluey’s Fish and Chips in Broome with kids. Address: Shop 6/ 16 Frederick St, Broome Bluey’s is the fish and chip shop to goto in Broome. An understated shop located in the old part of town by the Courthouse Markets on Frederick St. They use local barramundi for their Fish n Chips, which is highlight and nice change from cod or snapper here in Queensland. Though I can’t say it was the best, as we have some very decent fish and chip shops and a few favourites. It was very tasty , though a bit pricey; 3 pieces of fish, 2 potato cakes, small chips and a 1.5 litre drink will set you back $50, then again it’s Broome. My folks had a Chinese restaurant in a country town, so I always make a bee line for the local Chinese restaurant, when in a one. 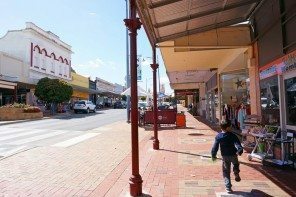 Read about my Stawell upbringing here. In my broken cantonese I spoke to the owner Mrs Yu and was able to discover that the Yu’s have run the restaurants since the 1980’s. However, it’s been in the family for 5 generations. I asked if her kids are still in Broome, which she replied they have all real jobs in the city. When I asked if they come home from time to time, she replied, if they didn’t return to Brome, they would have to answer to five generations of their ancestors whom are buried in Broom’s famous cemetery. The restaurant itself is stark, uneventful and has no historical tie. The food however is pretty good, it’s old school western style cantonese. The typical chicken corn soups laced with MSG and glossy stir fry dishes you expect from a country town Chinese shop. It’s quite pricey for takeaway at $70 for couple of standard mains a rice and a soup. Perhaps these are just Broome prices? 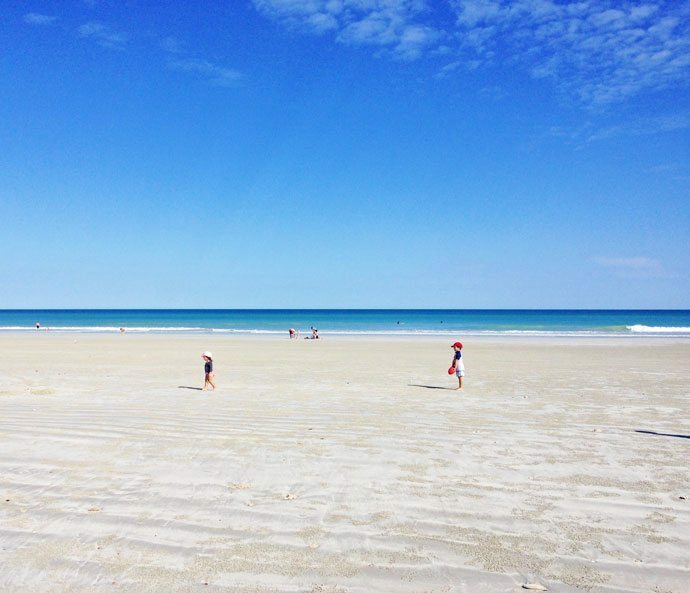 There are many people that stay near Cable Beach and make it the primary holiday destination. 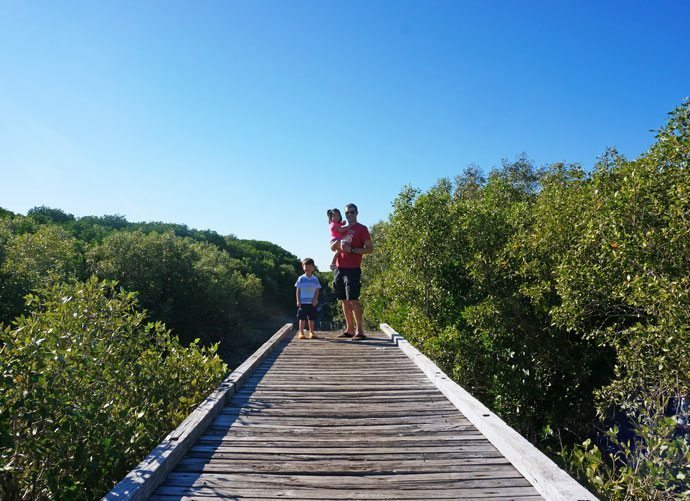 Being from the East Coast, we combined Broome with a trip to Darwin for Kakadu National Park. 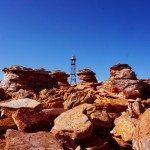 Broome is also the gateway to the Kimberley and worth a drive around dramatic countryside of red arid plains, waterholes, rivers and rocky gorges. To cover Broome’s highlights, a minimum of 2 full days is required. However an extra day or two dedicated to relaxing by beautiful Cable Beach is nice. 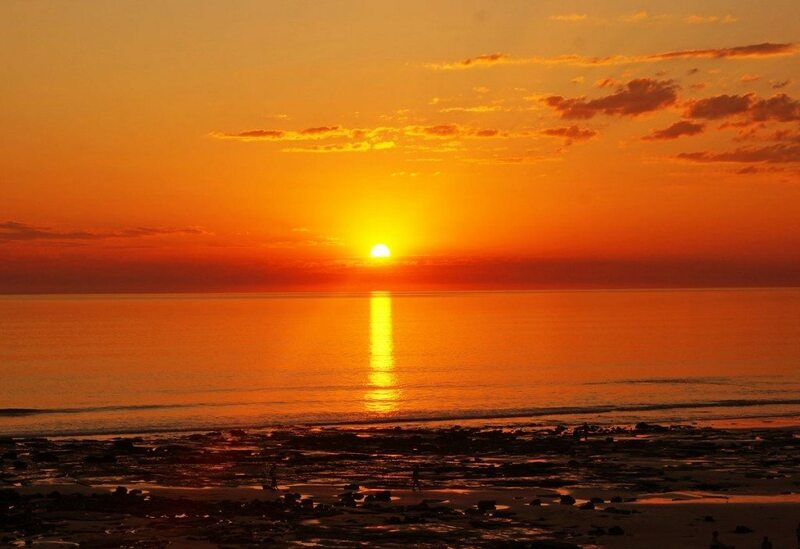 Direct flights from the East Coast takes you to Broome with a duration of 5 hours or less. Please check with Qantas or Virgin website as direct flights do not operate every day of the week. A flight stopping via Perth or Sydney will add an extra 2 hours to your journey. Qantas flies direct from Brisbane to Broome in 5 hours and 10 minutes. These operate once a week on Sundays. I highly recommend flying with a carseat for the toddlers. Spend as long as you want for a relaxed beachside holiday with a minimum of 3 days in Broome itself to cover Cable Beach and surrounds. Unfortunately Qantas no longer fly direct to Darwin, stopping at Kunnunurra, which looks to be an amazing place to stop on route to Darwin. The flight time is 1 hr and 20 minutes with a 30 minute stop at Kunnunurra airport. From Kunnunurra to Darwin is another hour flight. To explore Darwin you need a minimum of 3 days in Kakadu and at least a day in Darwin to cover the highlights. 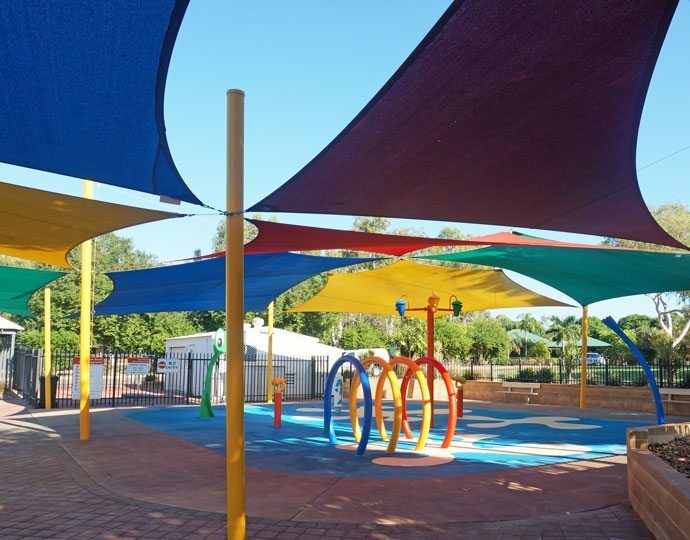 Click to read my Darwin with Kids City Guide and Kakadu with Kids posts here. Impressive Tips!! I am so pleased to enjoyed the post! Thanks. ? Lots of great info! But have to point out…. It’s ‘mud FLATs’ not ‘flaps’ lol. Mud flaps are the things on the car. You did such a fabulous comprehensive write up! For the first time I get so close to dinosaur tracks and pearling; love the vivid red cliffs against the blue! How long did you stay there? Oh wow! This is amazing! Cable beach looks absolutely stunning! I would definitely go for a camel ride… why not?! Gantheaume Point and the dinosaur tracks looks super cool too. Oh how I wish I could fly there now! Thanks Jennifer. I know it in my bones you’ll make it to Oz and Broome one day. There’s this growing divide between being a “tourist” and a “traveller”, the purists would not do such touristy things. But you’re right, why not!? I would definitely ride the camels. I’m sure it’s touristy – some things are touristy for a reason! As long as they’re treating the camels right we’re all good. Thanks 🙂 Love your site and your fab travel style. Hope we get to meet one day and do some super touristy things together. That could work, judging by your blog!